If an elk walks through a forest and there’s no scientist there to count it, does it make a sound? Or more importantly—does it make an impact on forest managers’ decisions? To understand how development in Utah’s Wasatch canyons affects wildlife, decisionmakers first have to know what wildlife is there. That’s a task easier said than done. Doctoral student Austin Green and a small army of volunteer citizen scientists are up to the challenge. Green is a student in the school of biological sciences and the leader of a project to keep an eye—210 eyes, actually—on wildlife in canyons up and down the Wasatch Front. He hopes his data will reveal which mammals are living in the canyons, how many there are, and how development is affecting them. It’s a big project. And he’s found a lot of helping hands. Citizen scientists are a big part of Green’s work. U biology students have been using camera traps in Red Butte Canyon, above the University of Utah, since 2012 to track mammal populations. The “traps” don’t trap animals at all. They’re just passive observers, cameras strapped to a tree that take a snapshot whenever an animal crosses into their field of view. From that Red Butte data, the researchers have identified deer, elk, raccoons, coyotes, moose and turkeys living in the canyon. Since Red Butte is undeveloped and relatively undisturbed, it provides a good study laboratory. But mammals in other Wasatch canyons haven’t been watched as closely. The U.S. Forest Service and Utah Department of Wildlife Resources tracks numbers of moose, deer and elk, Green says. With his study, he’s hoping to change that. And he’s not doing it alone. He’s partnered with organizations around the state to share data and resources, including the Wild Utah Project, BYU, the Natural History Museum of Utah and Hogle Zoo. 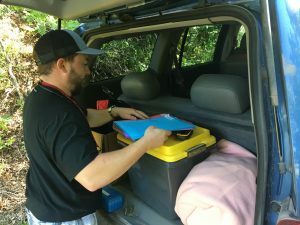 The U.S Forest Service and Utah Division of Wildlife Resources have also partnered with Green, as has the Salt Lake City Parks and Public Lands Program. All of these groups are vitally interested in what the camera traps will see. Green has 70 of them, deployed in all the major Salt Lake County canyons, as far east as Park City and as far west as the Jordan River. Each camera is about the size of a thick paperback book and mounted on a tree with a protective casing. Through trial and error, Green and his fellow biology students have refined the best settings to make sure they’re capturing the right things on the cameras. The trigger is activated by changes in temperature in the camera’s field of view, and after snapping the initial photo, will wait 15 seconds to take another. To multiply his 70 cameras over 210 sites, Green and a dedicated group of volunteers maintain the cameras and rotate each camera through three sites over the course of the summer. 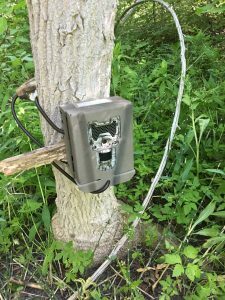 Early in the summer, volunteers set up the cameras at pre-determined sites, checked it after two weeks, and took it down two weeks after that to move the camera to a new site. Volunteers were able to select their preferred camera site locations and the difficulty level of accessing the site. For some volunteers at easily accessible sites, a visit to the camera traps can take an hour. For some, Green says, it’s a full day. Kait West, a U graduate, is one of Green’s volunteers. She’s a hunter and board member of the Utah chapter of Backcountry Hunters and Anglers, and heard about the project when Green visited their chapter. 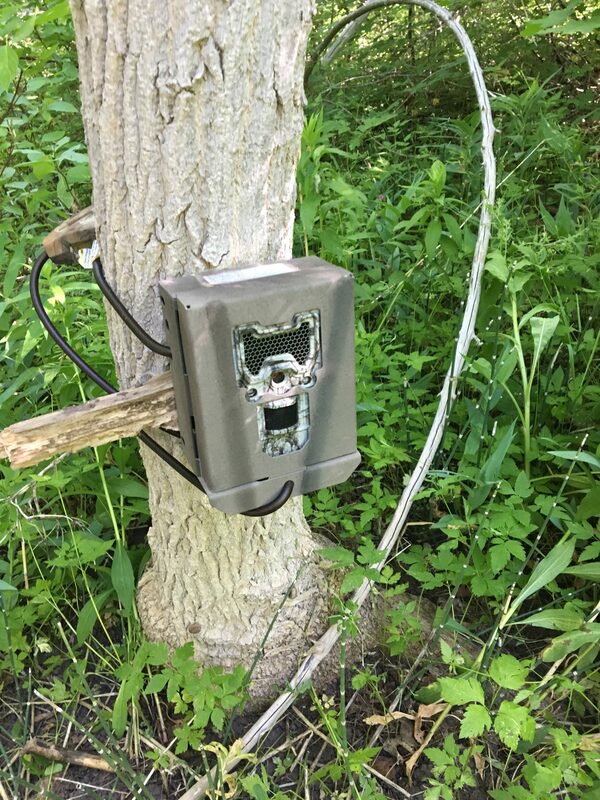 Her camera trap locations are all in Big Cottonwood Canyon, on the Beartrap Fork and Silver Fork trails. Her camera was stolen while at its second station of the summer (Green says around 10-20 percent of cameras are stolen) but a replacement is now in place. Green says that engaging members of the public in this work, and fostering a conservation mindset, helps achieve the project’s goals. Although the summer 2018 field season is winding down, the project and the opportunity to join in, are ongoing. Green will still need citizen scientists to help him enter and process the camera data via citizen science websites Zooniverse and eMammal—no hiking required. Contact Lisa Thompson, citizen science coordinator at the Natural History Museum of Utah at 801-587-3611 or lthompson@nhmu.utah.edu. Visit the Wild Utah Project’s citizen science page here. Registration is closed for the projects currently listed at that site, but check back for new opportunities. Registration for next year’s camera trapping field season, Green says, begins next spring. Sign up for Zooniverse.org. “All current citizen science camera projects that are being crowdsourced are featured on Zooniverse,” Green says. “You can go there now and you can contribute to those projects. I do it for fun.” His project will soon be featured there as well. Sign up for eMammal to identify animals pictured by the cameras. This site requires an invitation, which Green can provide. You can also contact Green directly at Austin.m.green@utah.edu.